JNN 02 June 2014 Battles rage on between Ukrainian forces and pro-Moscow activists for control of a post located near the border with Russia in a suburb of the volatile eastern city of Lugansk. According to reports, the Kiev authorities are pushing ahead with military operations in the eastern part of Ukraine. The Ukrainian army fighter jets have struck the regional administration headquarters in Lugansk, causing in a fire to break out inside the building. There are also reports of fatalities after the premise was targeted by the Ukrainian forces form the air. The bombardment comes after armed men attacked a border guard station outside Lugansk early Monday and the Ukrainian soldiers responded by opening fire on the assailants. The Ukrainian State Border Service said at least five people have been killed and several others injured in armed clashes between the self-defense forces and pro-Kiev military in the city. Meanwhile, a video has emerged, showing a number of the Ukrainian forces surrendering to the supporters of the self-proclaimed People’s Republic of Lugansk. 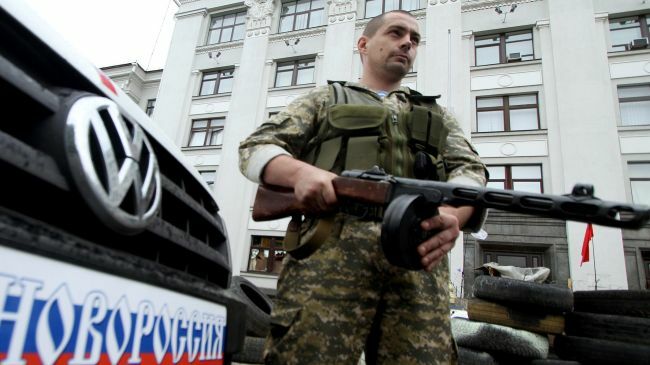 Lugansk declared independence from Ukraine following a referendum on May 12. The referendum followed a similar vote in Crimea in March that led to the reunification of the Black Sea peninsula with the Russian Federation. A number of Ukrainian border guards have been injured in an attack on their camp in the volatile eastern city of Lugansk. Ukraine’s border guard service said some 100 armed men ambushed the camp located close to the border with Russia early Monday. The guard service added that the Ukrainian soldiers responded by opening fire on the assailants whose numbers increased to 400 in a few hours’ time. The incident comes amid escalating tensions between Ukrainian government forces and pro-Russian groups in the east. Intense fighting broke out in the eastern city of Donetsk on May 26, with Ukrainian government air and ground forces attacking pro-Russian groups’ positions. The Ukrainian forces targeted the Sergei Prokofiev Airport with military air assaults after it was seized by armed men who identified themselves as representatives of the so-called Donetsk People’s Republic. Three days later, pro-Russians shot down a Ukrainian military helicopter, killing at least 14 soldiers in the city of Slavyansk. The government in Kiev has been staging military operations since mid-April in the eastern and southern regions in a bid to root out pro-Moscow demonstrations. Ukraine’s President-elect Petro Poroshenko has pledged to put an end to the war and bring peace to the former Soviet state. The 48-year-old chocolate tycoon has also ruled out negotiations with the pro-Russians, vowing to continue military operations in the country’s southeastern provinces. This entry was posted in Europe and tagged Lugansk, military operations, Pro Russian Militants, Ukraine, Ukrainian government, Ukrainian State Border Service. Bookmark the permalink.